Click here to view the PDF version of the plans. JUMPSTART was a rush development job after deciding to attend the 2016 Indoor Nationals at Rantoul, Illinois. Never having flown category 2 catapult it seemed a good idea to study what the Greats were doing. Bill Gowen, the record holder, had been very generous with information he posted on the hippocketaeronautics builder's forum. Kurt Krempetz, also at Bill's level of performance, was completely open with his process. Both of those gentlemen had developed techniques to make the lightest gliders possible. After much testing each had discovered their own best foam, and ways to acquire useful carbon threads with clever methods of application. They put in countless hours on this problem, enjoying it I'm sure, and then offering all that they learned to help others be successful. Jumpstart takes a different approach. Kurt and Bill seemed to sacrifice airfoil for lightness. Lightness is important but airfoil might be more important if the model can at least be reasonably light. After trying several foams the foam from the core of an Adam's foam board was settled upon. The outside paper peels off easily but the foam has to be shaved flat and then to the right thickness. Not quite as light as the foam others were using, 2.2lb, it had important qualities: Cheap, except for labor; easily available; seemed like a reasonable flex; sanded about like balsa and came out fairly smooth. Next was to find out how much energy it takes to shoot one of these models to the Rantoul ceiling, 44ft.? Kurt was asked but his unique launch technique, holding the very nose where the hook is located, uses more rubber than would be needed holding the model at the back. Testing had to be done outdoors on the calmest mornings, another hurdle. Outdoor launches do not climb as high as indoor launches with the same rubber and the altitude was just an estimate. Luck! Ralph Ray, current holder of the Category 4 Standard Catapult Record, was going to the Chicago area during the time a practice session at Rantoul was being held. Ralph agreed to take 4 models and test various cross sections of rubber to see what combination made it to the ceiling. THANKS! With the approximate rubber launcher known, testing could be done to produce a model that might not flutter or bunt too much. Flutter and bunt may be related and are very complicated, the reasons they exist won't be explained here. Flutter is an absolute altitude killer. If a catapult model flutters at a given power it will never get higher by applying more power. Many factors contribute to flutter. After choosing all of the other aspects of the model flutter comes down to material thickness and launch technique. 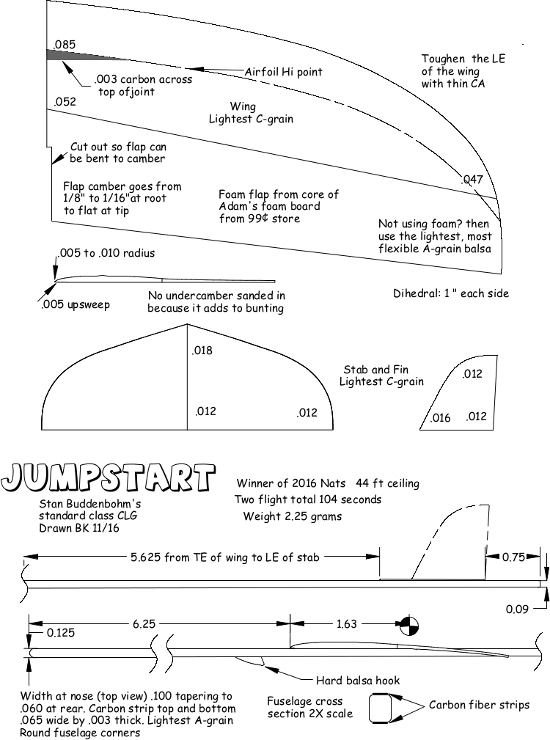 The thicknesses shown on the plan have been carefully worked out and are the minimum thicknesses to not flutter when using enough speed to get to 44 ft. To reduce flutter with the launch let go as smoothly as possible. Also the more vertical the launch the less likelihood of flutter. Bunting is affected by some of the same things that affect flutter, plus decalage, airfoil, and wing twists. Balance Jumpstart at the CG shown and adjust decalage to get a nice glide. If you have used the thicknesses shown the bunt should be workable for 44 ft. The flap can be evenly tapered so the TE is about 1/32 thick. Bending the airfoil into the flap: This is not hard. Just gently rub the flap between your fingers, span wise, while bending it more than the end result you want. The more times you do this the more permanent it becomes. After storing the glider you will likely have to do this bending again but now it will only take a few times to get the camber back. A few notes on construction: Glue the flaps to the balsa with Weldbond Universal Adhesive or a foam friendly version of CyA. Assemble the rest of the model with Duco Cement or CyA. Jumpstart's plan form ideas are borrowed from Bill and Kurt. Tail moment and nose moment are pretty much Kurt's. Set the vertical fin on straight and then bend the bottom of its TE about 1/32 right for launching. Add stab tilt for glide turn. Jumpstart climbs and glides right. Both of these are starting places and need to be adjusted to be optimum. Giant glide circles are not better than 30 ft glide circles at these glide speeds. Launch Rubber: If you don't have a rubber stripper then use a loop of 1/16 Super Sport rubber from FAI Model Supply. If you do have a rubber stripper then begin with .050 about 7" long. A good plan is to adjust the length or cross section so that you can apply a full stretch and not quite bang the ceiling.